DiTommaso provided additional comments in an interview with WeedSmart, an Australian podcast fosusing on weed control and emerging weed issues. Australia has experienced steady reductions in rainfall over the past 20 years while growers in New York are seeing an increase in extreme climate events such as flooding and unexpected freezes. Given that these trends are predicted to continue, together with warming temperatures, DiTommaso emphasized the importance of diversifying cropping systems and developing more climate resilient varieties. New weed challenges are also expected to emerge, and growers are urged to follow updated management recommendations and report changes they observe in weed species. Some research also suggests that changing CO2 levels may impact herbicide efficacy. DiTommaso, professor and chair of the SIPS Soil and Crop Sciences Section, researches environmental effects on weed species and strategies for weed control through manipulation of biotic and abiotic factors. The Australasian Weed Congress is a biennial conference and carries on a long tradition of bringing the weed management community together to discuss new developments and share information about cutting-edge and best weed management practices. The conference attracts more than 250 delegates from across Australasia and globally. Other speakers discussed topics including research priorities for weed suppression in Australia and developments in robotic weed sensing. 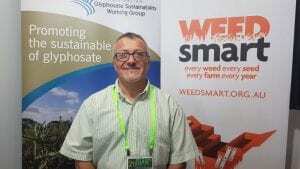 The complete WeedSmart podcast can be found at: https://soundcloud.com/weedsmart/australasian-weeds-conference. The interview with DiTommaso begins at the 5 minutes mark.